Placeholder for the 2.8" TFT Touch Shield v2 instructions. The extremely talented notro has beening working hard to produce a raspbian based image that has the drivers built into the kernel. Old instructions left here for those that prefer that method. As always many thanks to Notro for the excellent fbtft drivers, without which these products would not exist. This new version 2 board was required because the original HY28A display has been discontinued and replaced by the HY28B. Although no major performance improvements exist, it is wired differently, so required a new pcb layout. The display board now uses the ili9325 control chip and also the touch panel is mounted 180 degrees out compared to the HY28A. Screen and TP use hardware SPI ( SLCK, MOSI, MISO, CE0 & CE1 ) plus 3 additional GPIO lines ( GPIO17, GPIO18 & GPIO25 ), keeping the other GPIO lines free for other uses - the pcb has a 'breakout' GPIO port to connect too. It is recommended to use the latest raspbian image of 2013-12-20. At this point, the screen will go from white to black - the display has been successfully initialised. Note that if you have other input devices, ie keyboard and/or mouse, /dev/input/event0 may be, for example /dev/input/event1 or /dev/input/event2 or /dev/input/event3, etc. With this configuration, the screen has been rotated for landscape use. In order to use the touch panel with X, the touch panel input also needs rotating. Note that with Raspbian images from 2013-12-20, fbturbo has been enabled by default, which means that an additional configuration change is required. This allows X11 to be used with, or without the TFT display. so all of the options are one 1 single line. 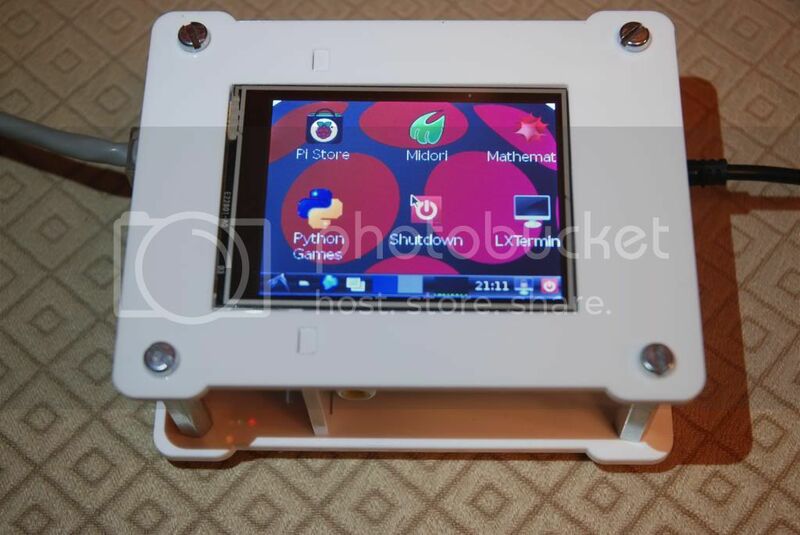 Note all of the instructions in this post assume you wish to use the display/touch panel in landscape mode, with the hdmi connector at the top as you look at the pi/shield. Thanks for the screen Texy. Had it about a week. (2 Lil kiddies manage to reduce my RPI time by more than should be allowed). I had some issues setting it up (home is mounted on NFS which I had with the user option in /etc/fstab, which it turns out implies noexec hence the permission denied errors I was getting.. DOH.. still learned something I didn't know before)..
No problems at all with the screen itself. I mostly run headless and being able to see the console and plug in a keyboard when ssh says no way is just awesome. Im a middling coder in Python and C and would love to be able to write my own stuff straight to the screen so do you know any good examples/tutorial on writing to the frame buffer? (Linux general would do but Raspberry Pi specific would be awesome). and change it whatever you need, note that 0 sets the screensaver to disabled. Dear Texy and other interested peoples. Here's what I did with my TFT display. My water cooler had a mechanical thermostat which never kept the water temp that stable, or cold. It would fluctuate between approx 4deg and 9deg C.
The solution was of course a Raspberry Pi coupled with a DS18B20 temp sensor and some code that controlled turning a relay on and off to run the water cooler's compressor. I captured a short video of the device in action, but unfortunately this board doesn't allow posting of files with .mp4 extension. I tried uploading it as a bzip2 attachment instead but was told 64Kbyte was the maximum size (yes, even now in 2014! what file is any use under 64KB?!). I then tried a couple of photos. Nope, too large. *sigh*. Almost ready to give up I managed to get the two low-res images attached, but they really don't do it justice! Anyway, the code is a collection of different types. We have some python to monitor the temp and controller the compressor relay (more complex than it sounds when there are rules about how long it can remain on, how long it must remain off minmum and how to ensure it doesn't freeze etc). That was coupled with some bash scripts to generate graphs from the logged data using gnuplot on a regular basis and also to monitor the button attached to the GPIO pin to sense when a user wants to change screens. Any questions just ask and I'll do what I can to help answer. Thanks for giving me the possibility for all the fun I had with this project Texy! Hi. Do you know whether this works with XBMC? It "should" work, but I haven't tried it for some time and I know that xbmc is constantly changing. Search the v1b/c thread for details on how it was configured then. You dont need to be concerned about screen resolution because I used a method of copying the main output to the TFT using fbcp, which takes care of all of that. Certainly the touch panel wasn't working at that point. Thank you very much for reading, PLEASE get back to me if you could help! edit:just another thought should I try opening the img on my mackintosh while the sd is plugged in and just copy over the files of the img and have them replace the ones in the boot partition or would that not do it any good? also I just realised that i needed to unmount the original boot partition and replace it with the new one of the img file but still its say that the partition is "busy" which has confused me further because im sure thats where I was going wrong....or is it the type of lunix os im running? Please don't advertise my dropbox link image, as I have limited bandwidth on that account and I only give to those who are really struggling. I have edited you post. Is there any chance you could do two of these without the headers soldered in? I am using the display with model As and I would like the overall height to be lower by sticking on a standard pin header. Of course, if anyone else would like the same, I am sure Texy won't mind if you chip in and he can then do a batch this way. Note to anyone interested, it is possible to cut the existing headers off and put alternative ones on (I have done it a couple of times) but the soldering iron clearance for the inner row of the pin header is really tight - I had to use a smd head on my iron. Fiddly job tho, hence my request to texy. EDIT: be aware that in an attempt to get maximally reduced height, I cut off the composite connector on the Pi. YMMV. Check what you need to cut off before modding the LCD! Last edited by BBUK on Fri Jan 31, 2014 10:37 pm, edited 1 time in total. Yeah this is possible. I just dug out my model A to check, and no problems found. I can build a couple over the weekend, but I'd like payment first. the module is up and running, but the calibration process fails. There is a dialog shown to push the crosshairs, but I do not see any crosshairs. Whats going wrong? Do you have a hdmi screen/TV connected to the pi? If so remove it - I recommend you have no mouse or keyboard or hdmi device connected to the pi , and you SSH into it via laptop/pc/mac during configuration. I do not know what I'm doing wrong. I cannot manage the display working. The only thing that worked for display was raspbmc mirrored with the instruction for the v1 shield. But I could calibrate the touch for raspbian, but never got anything but a white screen. I want to use this in my car, but also as a camdisplay (not at the same time). berryIO showed GPIO working. Anyone can help? I just want to see something when using raspian - that would help. But I could calibrate the touch for raspbian, but never got anything but a white screen. If so what happened when you run the test python program? "At this point, the screen will go from white to black - the display has been successfully initialised." It turns black but just for a second. and then keeps on being white. There are no crosshairs, but ich can use the display as touchscreen - arrow moves - but display remains white. Made some progress since my last comment. Ive managed to calibrate the screen through ssh the cross hatches did respond. As I carried on I manage to get the python "touch here to exit" to appear and eventually onwards to the desktop. But the screen keeps glitching? A bit like when theres a virus on a computer or its really slow and you drag a window and it does that thing where it repeats the image behind really quickly when you drag it, if im making any sense, anyway. What a appears on the tft seems to be version of that, it keeps repeating an area of its self above the previous one and Im not sure what that could be down to?...also after I type the command FRAMEBUFFER=/dev/fb1 startx -- -dpi 60 the desktop appears and I've done the sudo nano /boot/cmdline.txt and when I go to reboot through SSH nothing appears again on the tft ? angusmedia wrote: "At this point, the screen will go from white to black - the display has been successfully initialised." It turns black but just for a second. and then keeps on being white. That is expected - you haven't redirected the console to the TFT at that point, so nothing will display on it unless you use a program that can redirect to fb1. angusmedia wrote: There are no crosshairs, but ich can use the display as touchscreen - arrow moves - but display remains white. Souns similar to the problem above - do you have hdmi screen attached? You haven't correctly copied the python program listing from the first post. Not sure about the glitching - are you able to post a picture or video? Regarding losing the console after reboot - are you sure that the cmdline.txt is all on one line and copied correctly? Haven't had the time to start again. But you are doing good work - you really care about your customer. Thanks a really LOT...even if there will be some more questions... 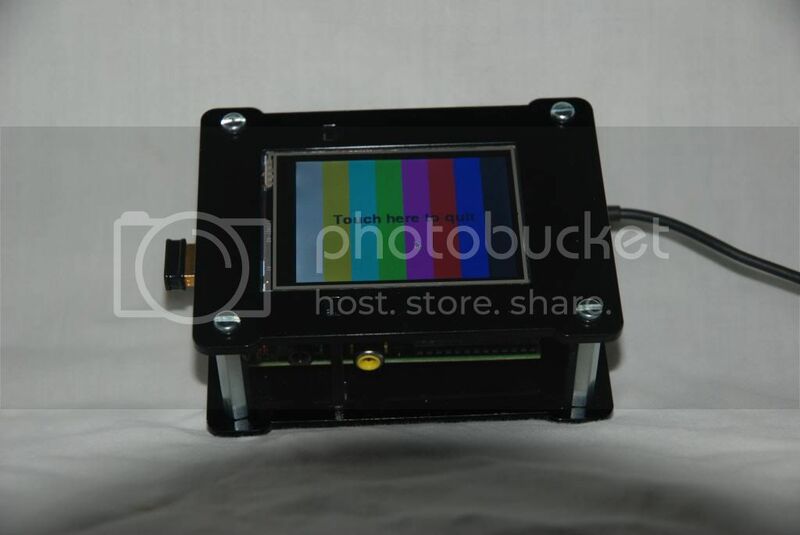 I'm sooo sorry, but I tried several Images to start - from NOOBS to actual Raspian and 2013-12-20-wheezy-raspbian-2014-01-03-fbtft.img and I never can see anything on TFT screen - even if there is nothing connected exept WLAN or just a LAN cable - nothing happens. I could get a cheaper pocketlighter doing the same. I never had problems like this on any computer. My screen arrived on Monday (days ahead of my expectation), and I picked it up from the post office yesterday. I've still got to clean things up (such as starting fbcp at boot, or at least with XBMC), and I've got some permissions issues, but those are all of my own making. Now to go back and play with the touch screen side of things.